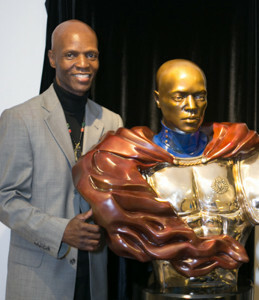 Nijel Binns is accomplished in portrait sculpture, and painting in the realist tradition. His artistic expression also includes three published books on the martial arts, a Screen Actors Guild membership for stuntwork and a motion picture fight choreographer of five films. Nijel Binns was born in Battersea, England in 1956 to African and Jamaican parents. He became a United States citizen in the mid 60’s. After his introduction to painting and sculpture at St. Benedict’s Preparatory and Seton Hall High schools in New Jersey, Nijel continued his education with independent study of great works of art. He received professional mentorship under master sculptor Felix De Weldon (best known for the Iwo Jima Monument), as well as mentorship under the senior African American sculptor Ed Dwight. Nijel’s skill as a portrait sculptor was first acknowledged with a commission to sculpt pop icon, Michael Jackson in 1990 for the “Top Selling Artist of the Decade” tribute. Also that year, Nijel received a commission from Motown Records to create the gold plated, Maasai Princess bronze sculpture for singer Stevie Wonder. Additional portrait sculptures followed including a wax portrait sculpture of the late astronaut Colonel Ron McNair for the Great Blacks in Wax Museum in Baltimore, MD, as well as the only life-sized bronzed sculpture of the famous child actress Shirley Temple for Fox Studios. There is also a life-sized bronze busts of Los Angeles’ retired Urban League President John W. Mack for the Los Angeles Urban League Headquarters, and a life sized bronze bust of Councilman retired Nate Holden for the Nate Holden Performing Arts Center in Los Angeles. Nijel’s large bas reliefs are found at the John W. Mack Elementary School, and at the Charmette Bonpua Skate Park in Los Angeles. On a smaller scale, until recently, Nijel has produced yearly awards for the Los Angeles Urban League, the Lula Washington’s Dance Company, The Pan African Film Festival and medallic art for the In The Meantime Men’s Group in Los Angeles, and The American Society for Cell Biology in Bethesda, MD . Nijel’s largest public monument to date is the 16 ft. tall, two ton bronze “Mother of Humanity®” monument. It is a tribute to peace, a mother’s loving-kindness, and the singularity of the human family. The monument was unveiled on Mother’s Day, May 11, 1996 and is permanently installed at the Watts Labor Community Action Committee in Watts, CA. Nijel recently unveiled a monument to the Honorable Mervyn M. Dymally in his home town of Cedros, Trinidad. Forthcoming state side commissions include a bronze memorial to fallen officers for the Los Angeles Department of Cultural Affairs, and a massive Mexican American All Wars Memorial in East Los Angeles. Long term International projects include The Mother of Humanity® AFRICA project which is a gift from the people of the United States of America to the people of Africa. 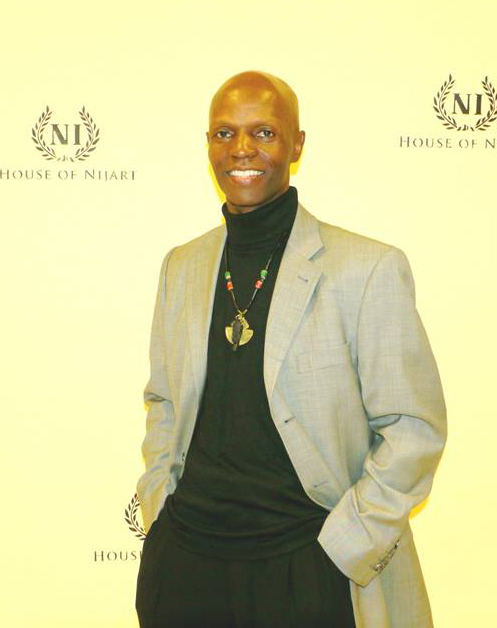 Nijel Binns heads the L.A. based sculpting firm Nijart International, LLC and may be contacted at Nijart@pacbell.net. l.os Angeles is the base for my creativity. Since my move here in 1980, I continue to be inspired and motivated by this great city and such a diverse ethnic population. As a result, I have contributed significantly to the Los Angeles cultural landscape with monumental art such as the Mother of Humanity® Monument in Watts, the Shirley Temple monument at Fox Studios, the Charmette Bonpua Memorial, and many others. It is this “preservation of legacy” that drives and informs my sculptures, paintings and books. In truth however, I am simply continuing a tradition begun long ago in ancient Egypt. Perhaps award winning writer Alex Haley summed it up best when he said simply,… “Find the good and praise it”. Nijel Binns showcases Art in South L.A.